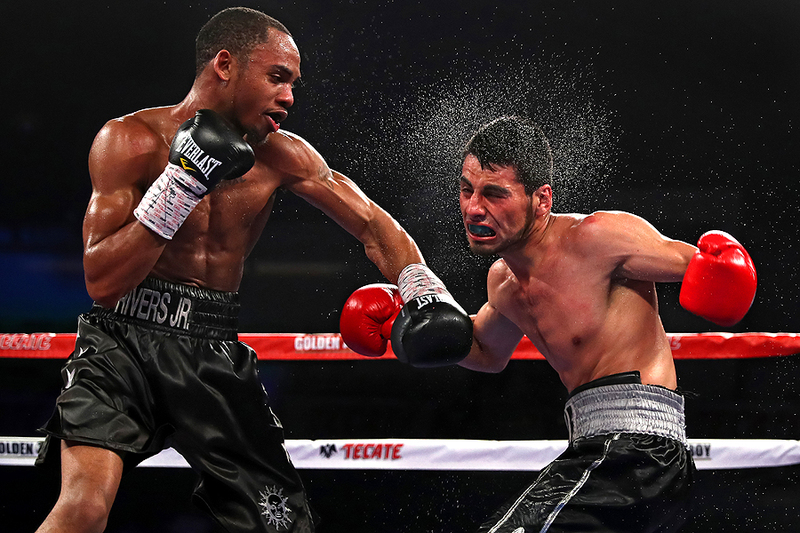 "Angel Aispuro is punched by Palmer Park in their featherweights match at the DC Armory on March 5, 2016 in Washington, DC." If there is one thing I hope for when documenting sports, it's a clean background. A backdrop that isn't cluttered with advertisements or distracting elements is the greatest canvas. It makes shooting action much easier. You're not constantly running around the venue looking for the cleanest angle. Late last year when documented boxing, large sign boards ruined a lot of great images in my opinion. Some will say that a moment always defeats a busy background. But I feel lit advertisement boards will always be an eye sore. So when I arrived at the DC Armory last weekend for a large fight card, the first thing I did was notice how clean the backdrop was. I only wish all indoor sporting events were lit only on the athletes and not the fans. The contrast from the sweat, water continually helped make pictures throughout the night. And while there were a lot of bloody fights, I kept coming back to this frame just for the fact that it's clean.